« Why is NCGOP Protecting Non-Citizen Voters? 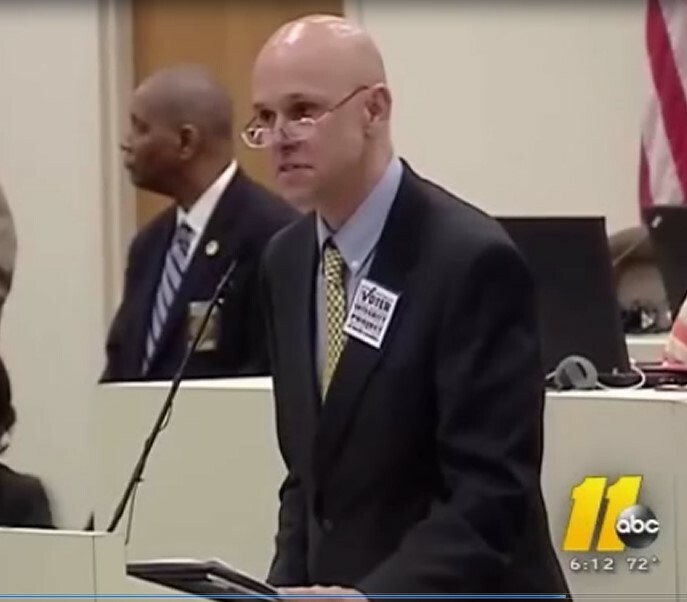 Jay DeLancy addressed the NC House Committee on Election Oversight in 2013. In early 2012, I joined forces with a quality engineer named John Pizzo and we began analyzing North Carolina’s voter rolls. One of our first research projects was in Wake County (NC’s 2nd largest county), where we obtained jury records from the Clerk of Courts and determine which prospective jurors disqualified themselves by telling the court they were not US citizens. It was only a three-year snapshot, but we found around 6,000 non-citizen jury disqualifications. We then matched those names against the voter rolls and found 532 registered voters who had told officers of the courts that they were not US citizens. Of that group, 130 had voted at least once BEFORE their jury disqualification, meaning they either committed perjury or they committed vote fraud. We then decided to file voter challenges on the 532 voters and we explained our methodology at the preliminary hearing on the matter. Expecting a spirit of cooperation, we did not have legal counsel. To our surprise, the Board treated our actions as hostile and bent the law to reject our challenges. For example, our state’s DMV had only begun requiring proof of citizenship in 2004 (less than eight years before our challenges) and they issued 10-year licenses. Even so, unless the DMV had affirmative proof that the voter was not a citizen, they deemed all were citizens. Adding to the problem, the DMV’s witness did not testify at the hearings. Instead an SBOE employee, Veronica DeGraffenreid, testified with no knowledge of when the voters were issued their licenses. We could not cross examine her hearsay evidence, but the Board viewed it as 100% accurate and they rejected 514 of our challenges. The remaining 18 non-citizen voters were advanced to a full hearing because even the DMV agreed they were not citizens. Moving forward, we had learned how our challenges were rejected on procedural grounds, so we started the work all over again, this time seeking a much larger batch of jury disqualification data. But we soon learned that our state’s Administrative Office of the Courts had crafted a new interpretation of the jury list maintenance laws, such that even voters disqualified under NCGS § 9-3 were allowed the same privacy rights as the qualified jurors, on the “jury list,” under NCGS § 9-4. Thus, they blocked our access to the same public information they had allowed before we had embarrassed them. Realizing how difficult it would be to find an attorney and a judge who would fight the same agency that disciplines lawyers and judges, we decided not to sue and instead opted for a legislative remedy. In 2013, we asked State Representative George Cleveland to sponsor a bill that would maintain the public’s access to jury disqualification information, much the same as is legal in Florida. Rep Cleveland’s bill sailed through the House with overwhelming bi-partisan support, but was killed in the Senate Judiciary II Committee. In the 2015 General Assembly, Rep Cleveland tried again and this time we made it through the Judiciary II; but the Senate Rules Committee Chairman, Tom Apodaca, refused to allow a vote, so it died again. Now, in the 2017 legislative session, we have again gotten it through the House and this time, Sen Apodaca has retired, but the Senate Pro Tem, Phil Berger, has not allowed the matter to proceed. It’s been a long battle. The bottom line is this: By our looking at just one county, over a three-year period, we proved that there were hundreds of non-US citizens voting in our elections. If given proper access to information that state agencies refuse to share, I’m certain we could easily find at least 10,000 non-citizen voters in North Carolina. The key agencies hiding this information are our Court system, our Department of Corrections and our Department of Health and Human Services. They know the names of hundreds of thousands of non-US citizens living in North Carolina, but they refuse to share the data for voter-list maintenance purposes. And sadly, our state’s political leadership approves of this cover-up. As a reminder, two statewide North Carolina elections in 2016 were won by less than 5,000 votes, our Governor’s race was decided by around 10,000 votes; and finally, in 2008, our Presidential election was determined by only 14,000 votes. The public has a need to know and a right to know the truth about non-citizen voters in North Carolina, but our state’s corrupt two-party system is fighting to keep us all in the dark. We could use a little help! !